Damage at the Ring of Brodgar. Police are hunting “mindless” vandals who damaged a world-famous prehistoric site on Orkney. The etchings onto the standing stones at the Ring of Brodgar cannot be estimated in monetary value, according to the island’s police inspector. Six letters and two lines have been carved into one of the stones at the Neolithic ring near Stenness, in the heart of Orkney’s Unesco World Heritage Site. The damage was caused sometime between Friday afternoon and Sunday morning. There appears to be six letters N or Z V A K K I and two further lines drawn onto the stone. Inspector David Hall, of Orkney police, said: “The stones at the Ring of Brodgar are priceless historical artefacts and the damage caused cannot simply be estimated in monetary terms. 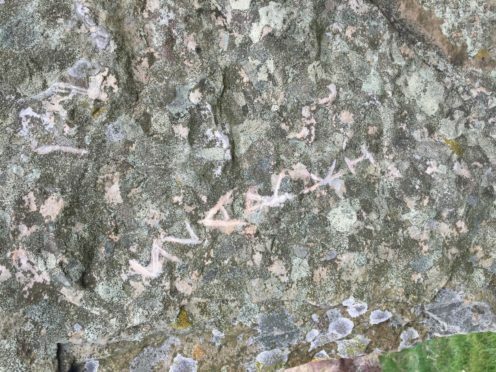 In 2015, a tour guide discovered the initials ‘AA 2015’ scratched into one of the stones. It is understood no one was prosecuted for the crime. On social media, calls have been made for CCTV cameras to be put near to the entrance of the site. But Sigrid Appleby, who lives at nearby Fursbeck Pottery, said: “People, like the Vikings and other visitors, have been doing this on Orkney for centuries – but of course, it is no longer socially acceptable, or appropriate. “Having CCTV near the Ring of Brodgar would be awful. It is bad enough up there at the moment as it is – with the one way system and the long walk to get in, and the areas people are not allowed to walk on. Information can be passed to Police Scotland by calling 101.